Featuring an intricate and colorful pattern the Pavo collection by Surya is truly a masterpiece of its own caliber. 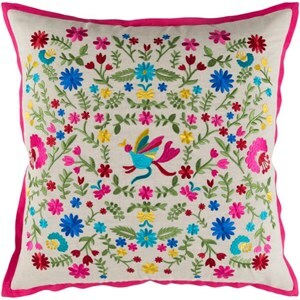 Woven in India, the front of this beautiful pillow is made with 55% linen, 45% cotton and the back is made with 55% linen, and 45% cotton. Bring your ideas and imagination to life with this well crafted piece, it will be sure to brighten up any home! The Pavo 7528 x 19 x 4 Pillow by Surya at Hudson's Furniture in the Tampa, St Petersburg, Orlando, Ormond Beach & Sarasota Florida area. Product availability may vary. Contact us for the most current availability on this product. Browse other items in the Pavo collection from Hudson's Furniture in the Tampa, St Petersburg, Orlando, Ormond Beach & Sarasota Florida area.